...When I push the crack closed, I get a tight fit along the entire length on the bottom side, but the top has an obvious, but small, gap about 40mm long in the middle of the crack length. No amount of flexing or manipulating the plate can get the crack to close in that area. ctanzio, can you post a pic with clamps on? I think that will help. Brad, yes that picture and post describe the nature of the crack after it is "closed". Jacob, I had a prophylactic cleat installed as you described and it probably stopped the crack from progressing any further up the bout even as it dramatically widened as the weather changed. Before I do anything else I will install a new cleat above the end of the crack, this time paying close attention to the cleat dimensions. Thanks for reminding me of the importance of doing this. To everyone who mentioned the possible saddle issues: I can see now that the purfling and crack at the edge is butting flush against the saddle. So I will trim back the saddle a hair at a time to see if that lets me get the crack closed through the entire length. Chung, some modest rubbing of the crack surfaces together sounds like a good idea once I get the crack to close so it only looks like a hair line. I can see this slightly compressing the crack surface high spots to get a flush fit. Don't worry about cutting back a hair at a time. I always have a small gap of 0.2mm, or so, at each end of the saddle to prevent those type of cracks. There has been some very good advice given here and I agree that the problem is a saddle crack where both the saddle must be removed for later adjustment and quite probably a bit of wood/purfling removed next to the saddle (low value instrument here) followed by judicious and carefully planned hydrating of the wood around the center of the crack before gluing and studding. I would also mention that I keep my working area significantly drier than my showroom or the humidity I recommend for instrument storage on the theory that most repairs or new instruments will have less serious problems should they wind up exposed to higher humidity than existed when they made rather than lower. Would some one with more clout to their credentials in the restoration department care to comment about the idea of "rubbing" cracks to make them fit? 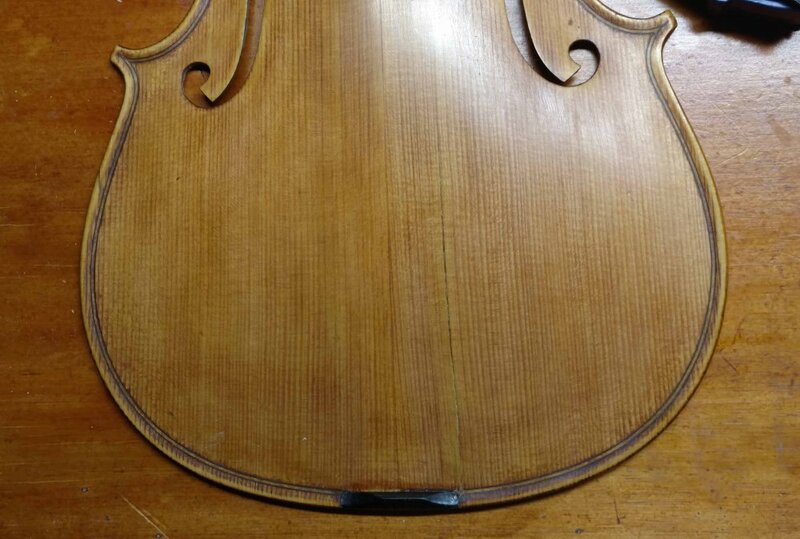 If I understand this correctly it sounds as if original wood may be damaged and back when I was dipping my toe into the world of fine instrument restoration every fiber was considered Holy. That's why I advised against rubbing the crack edges together. It will just damage the mating surfaces, and may likely damage the outer surface edges, making the retouch much more difficult. Caution expressed about rubbing mating surfaces together has been noted. I will check the fit after trimming the saddle then reconsider my options. I prepped a cleat stick and counter form as per the Triangle Strings reference. Slab cut spruce to 1/4" (6.4mm) thickness. Trim to a width of 1/2" (12.7mm). Angled width edges to 30degress to make a parallelogram shape. Drew a line on either side 1/4" in from edge to act as a guide to align the cleat with the crack. Made a counter form to keep the cleat edges snug with the plate while glue dried. Unless I am misunderstanding what you have pictured above the grain of your studs is running the wrong way. 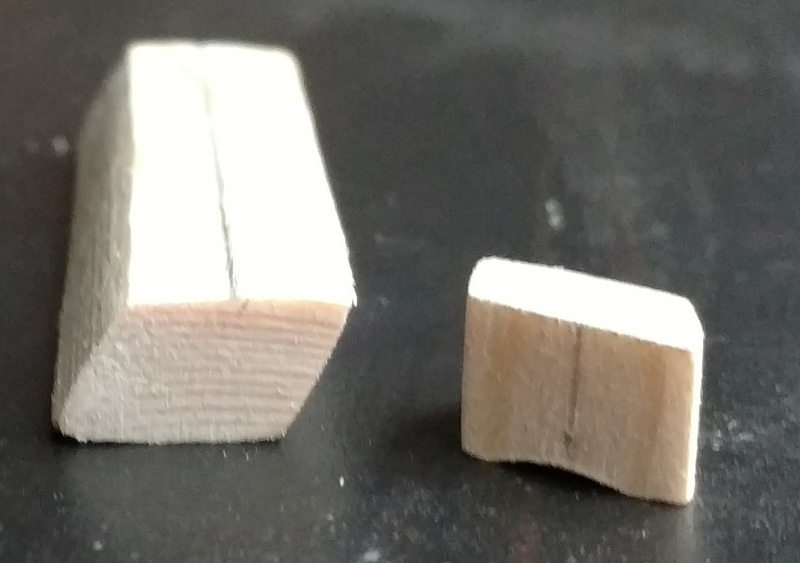 Easiest way to do cleats is to cut your preferred shape into a cross grained pillar so that you can hold on to the pillar and shape the end as needed to match the curve of the top and then split the cleat off to an appropriate thickness before gluing. After gluing the split cleat is both stronger and makes it easier to shave the cleat to shape before finishing with minimal sanding. The left side of the picture is supposed to be a cross-grained pillar. Maybe the camera perspective is confusing. The bottom of the picture is the end of the pillar and you can see the grain running horizontally across the face. The cleats I glued in last spring also had the grain going across the crack, but I glued them slab side down. The web site referenced in an earlier post seemed, to me, to say the grain side should be glued to the plate with the grain going across the crack. Did I misunderstand their directions? I encountered something unexpected when setting up the edge clamps prior to gluing the crack. The plate as it came off the violins did not have the edges sitting flat on a surface. The plate was splayed, like someone had grabbed the outer edges and permanently curled them up. As I applied the edge clamps to secure the plate to a 1" thick piece of plywood, the crack closed naturally so that it took what was probably its original shape as it was originally carved. There was a non-trivial amount of clamp pressure needed to get the edges to sit flush to the plywood. I left the plate clamped in a cool, dry room for about 72 hours. When I removed the clamps, I expected the crack to open and the plate to curl out-of-shape again. But the plate shape did not change. The edges now sat flush to the table while unclamped and the crack barely opened. It is as if all the deformation in the plate had been reversed by leaving it clamped to a flat surface for 3 days. Cleats should be shaped such that it has quater grain on the glueing surface. It is as if all the deformation in the plate had been reversed by leaving it clamped to a flat surface for 3 days. As I suggested before, the reason of an opened crack like here is usually s a deformation of the arching. In this case the belly wood was probably fresh enough that clamping it to the right shape in a heated room was enough to bring it to the correct form again. In other cases it would be necessary to dampen the deformed areas while the plate is fixed to a kind of bassbar frame. This method was described in some other threads here, too. Sometimes rib assembly is warped too, if that's the case you have to think about fitting top to the ribs, making top flat does not always works. I would also mention that I keep my working area significantly drier than my showroom or the humidity I recommend for instrument storage on the theory that most repairs or new instruments will have less serious problems should they wind up exposed to higher humidity than existed when they made rather than lower. I think it's highly important to know the moisture level in your working environment, and agree that assembling things in a drier environment is better than in one which is too moist. Wood handles compression better than it does tension.
" I left the plate clamped in a cool, dry room for about 72 hours. When I removed the clamps, I expected the crack to open and the plate to curl out-of-shape again. But the plate shape did not change. The edges now sat flush to the table while unclamped and the crack barely opened. It is as if all the deformation in the plate had been reversed by leaving it clamped to a flat surface for 3 days. " Now you need to check and see if the top of the ribs are flat. If the top of the ribs are warped, it will just cause the same strain when you pup the top back on. I have an aluminum plate frame that I use to clamp the top flat while working on it off the instrument.